Manila, Philippines - The weather bureau PAGASA on Thursday, January 30, 2014 issued first bulletin update for tropical depression or Bagyong 'Basyang'. Typhoon 'Basyang' spotted at east of Mindanao is about to enter the Philippine Area of Responsibility (PAR). 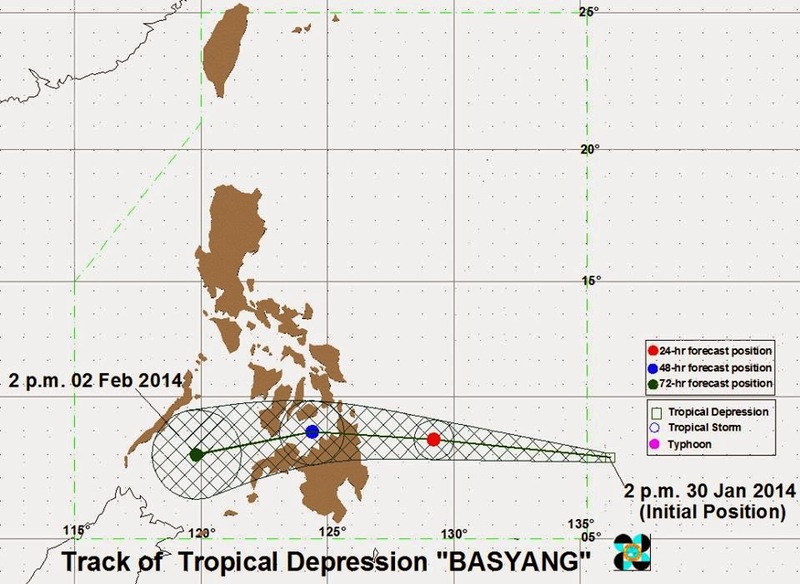 Bagyong 'Basyang' is expected to make landfall over Surigao Provinces late Friday evening or early Saturday morning. At 4:00 PM today, the center of Tropical Depression “BASYANG” was estimated based on satellite and surface data at 1,108 km East of Hinatuan, Surigao del Sur (8.6°N, 136.4°E). It has a maximum winds of 55 kph near the center and forecast to move West at 30 kph. 'Basyang' is expected to be at 320 km East Northeast of Hinatuan, Surigao del Sur by tomorrow afternoon and at 232 km West Northwest of Hinatuan, Surigao del Sur or at 90 km North of Cagayan de Oro City by Saturday afternoon. By Sunday afternoon, it is expected to be at 391 km West of Dipolog City. PAGASA raised storm warning signal 1 (winds of 30-60 kph is expected in at least 36 hours) in Surigao del Norte including Siargao Is., Surigao del Sur, Dinagat Province, Misamis Oriental and Southern Leyte. Meanwhile, fishing boats and other small seacrafts are advised not to venture out into the eastern seaboards of Central and Southern Luzon and of Visayas due to Tropical Depression “Basyang” and the Northeast Monsoon.